One has to get down at Kulem railway station and walk towards the falls which is about 11 km away. It normally takes 2–3 hours to reach. 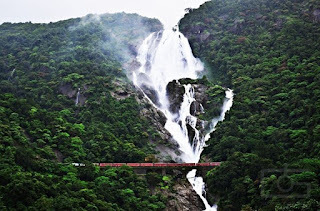 The famous photograph of Trains passing through before the waterfalls can be seen in this route and also the complete stretch of the falls will be visible while you hike towards the waterfalls. Meeting point at Pune Railway station at 15:00 Hrs. (Mumbai people reach pune by LTT KARAIKAL EXP or Private bus . Sleeper Coach Train Reservation from Pune to Kulem & back. 2. Bhagwan Mahaveer Sanctuary Jungle Entry Charges. One needs to transfer Rs 1300 as advance at the time of booking. No refund for any Cancellation.